Mark Deboo and auctioneer Roger Jacobs stand ready to sell bulls at the block. 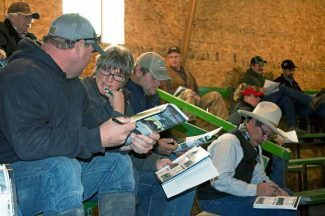 The weather couldn't stop eager customers from around the region from taking a seat at the Diamond D sale. Location: At the Ranch Valier, Mont. Lot 70P, DDA Just Right 70P, was sold for $16,000 to Patricia Muir of Suero, Texas. This DDA Lodge E5H son was born May 17, 2014 weighing 85 pounds and has EPDs of BW 2.2, WW 35, YW 50, and Milk 16. Lot 10N, RDDA Julian 10N, was sold for $16,000 to Bruns Red Angus of Bloomfield, Nebraska. This good Red Hill B571 Julian 84S son was born May, 2013 weighing 78 pounds and has EPDs of BW -2.2, WW 57, YW 85, and Milk 16. Lot 34P, DDA Cedar Ridge 34P, rung the bell at $14,000 purchased by Patricia Muir. This Cole Creek Cedar Ridge 1V son has EPDs BW 0.8, WW 39, YW 64, and Milk 24. He was born May 12, 2014 weighing 78 pounds. 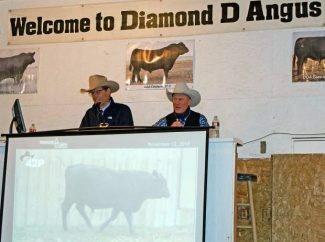 Lot 27P, DDA Marlin 27P, was sold for $11,000. Patricia Muir put a nice set of bulls together including this DDA Cedar Ridge 34M son who was born May 10, 2014, weighing 78 pounds. His EPDs include BW 1.9, WW 40, YW 62, and Milk 19.